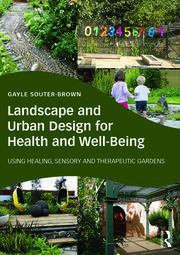 Gayle Souter-Brown founded Greenstone Design, the global-reach landscape + urban design consultancy in UK and then NZ. Her organisation researches, designs and advocates for biophilic accessible greenspace to governments and citizen groups. Their salutogenic design approach offers public health benefits across mental and physical health and well-being. Sensory-rich design for early childhood, schools, natural play, special needs and dementia gardens feature in Souter-Brown's extensive portfolio. A lifetime interest in design, disability, mental health and the environment coalesced into founding a landscape and urban design practice specialising in health and well-being. A natural speaker, teacher and experienced trainer, Gayle has run workshops, design studios, lectured and taught pre-school to adults. From the World Health Organisation to community-run Early Childhood Education providers, Gayle has presented to a global audience, written many articles and 2 books . Sensory gardens that provide places to pause, foods to pick and eat, objects to admire, scents to entice and sensations that enliven are her specialty. We work across education, health and aged care to advocate for, advise and design biophilic, salutogenic landscapes.